Welcome to our resources area. Here you will gain access to additional knowledge either about our company, doing business with us or news about what we do. 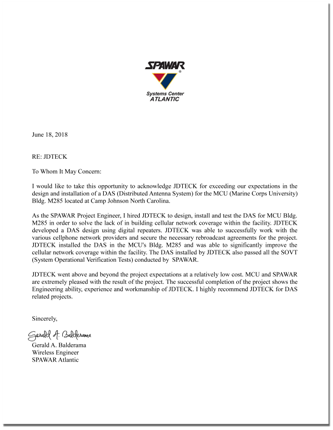 JDTECK Receives Letter of Recommendation. The US Marine Corps was looking for a reputable but affordably priced DAS solution for one of their facilities and turned to SPAWAR for guidance in this regard. JDTECK was successful in winning the contract for this project and exceeded expectations in all aspects of the project. Tracing the source using the FCC ID. Wherever cellular networks and end users intersect, JDTECK has a solution available to help fill in the gaps in coverage and improve the user experience.